Contemporary glass-walled meeting rooms complement restored wooden trusses. There was once a time when what went on in Masonic temples was shrouded in Freemason mystery. We may never know the ritual and pageantry that filled the multiple halls of the former Masonic Temple in Glendale, California, but a recent renovation of the 1929 concrete structure revived the nine-story art deco building, opening it up to new occupants—real estate giant CBRE—and filling the musty rooms with ample daylight. Originally designed by Arthur J. Lindley but remodeled at various times and then abandoned for three decades, the current 24,000-square-foot rehab by Gensler is the brainchild of developer Rick Caruso. It was done in record time; just ten months from start to finish. The most striking space is on the eighth floor, where the elevators dispatch visitors to reception in an unconventional scene. Refurbished multi-paned windows greet guests with vistas of the Verdugo Mountains (and Caruso Affiliated’s Americana complex), but the real drama happens in the reverse view: The floor drops away. 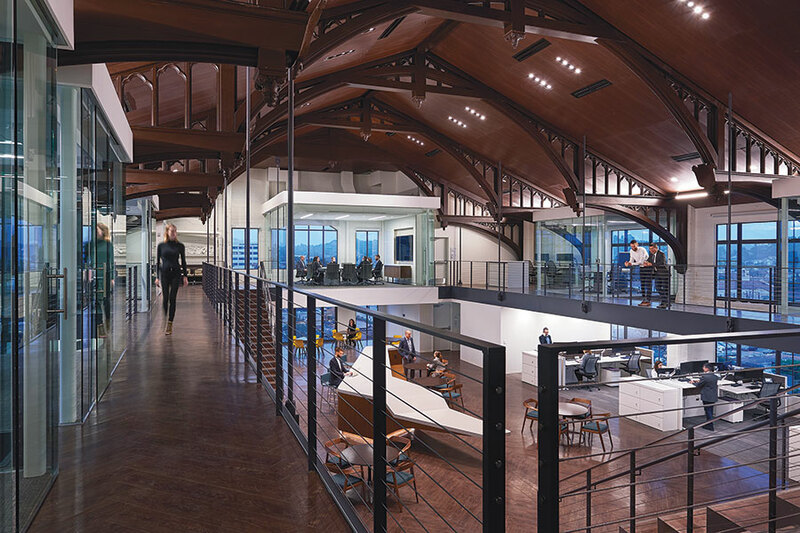 Gensler orchestrated the space so that rather than arriving at the bottom of a 26-foot-tall area, visitors take in the retrofitted Masonic Hall and its original dark-wood trusses from the mezzanine. The former Masonic Temple as viewed from the pool deck of Caruso Affiliated’s Americana. New 20-foot-tall windows spill bright daylight across the workplace, outfitted in a minimal palette and featuring all-glass meeting rooms, “focus” and “huddle” rooms, and rows of gleaming white workstations. A bleacher stair, designed for all-staff meetings, leads from the entry to what Gensler principal Carlos Posada calls “the heart” of the office—a boomerang-shaped island that easily multitasks as cafe space, informal desktop, and banquette seating. Round tables and chairs scattered around cater to CBRE’s “free-address” mandate—there are no assigned desks or offices. In converting the mini high-rise from clubhouse to flexible workplace, Gensler’s team first had to address larger seismic and structural issues. The building is unique in that every other floor—three total—is a large double-height volume: the top showstopper, the offices on the fifth and sixth, and a yet-to-be-finished third and fourth. In order to maintain the open spaces and introduce large windows, existing concrete-encased-steel and board-formed-concrete walls were upgraded. A pair of elevators (and core), plus two new egress staircases, were added to accommodate the change in tenant occupation. For Posada, the success of the space comes from not doing too much. Existing concrete was cleaned and painted, several of the wood trusses were rebuilt, and a sculptural stair was inserted between the sixth and seventh floors to add a sleek counterpoint to the rough walls. “We wanted to honor the building itself,” he explained. Currently, the double-height space on the ground floor is raw. Caruso hopes to bring in a restaurant tenant to take advantage of the lofty and historic real estate. One can’t help but wonder if the Masonic traditions will live on—perhaps the host will require a secret handshake and password for VIP access.